A memorial for the 17-year-old Muslim girl who was murdered nearby a Virginia mosque last weekend was set ablaze in Washington, D.C. this morning, fire officials said. 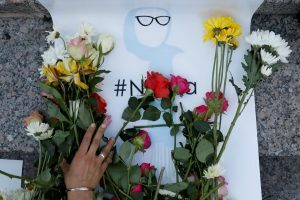 Officials told Fox5DC that the makeshift memorial in Dupont Circle for Nabra Hassanen was set on fire after remains were found burnt around the neighborhood’s fountain around 8:30 a.m. Wednesday. Authorities have detained a 24-year-old man from South Carolina in connection to the fire, The Hill reported. The Dupont neighborhood was one of several vigils held across the country Tuesday for the slain teen, who was found dead in a pond in Sterling, Virginia, on Sunday. Fairfax County Police said the murder is not being investigated as a hate crime. Instead, police said they believe the murder was the result of road rage. Hassanen and a group of other teenagers were walking and biking along a road after a Ramadan event at the All Dulles Area Muslim Society, ADAMS, Center, a large mosque in Sterling, when they got into a dispute with the suspect, Darwin Martinez Torres. Moments later, he attacked the group with a baseball bat, police said. Torres is suspected of beating and killing Hassanen. The girl’s body was found in a pond in Loudoun County, Virginia, hours later.